Social media marketing in the financial services space is extremely beneficial as a method of generating leads for your sales team. It will also help increase your brand awareness plus stay at the front of mind with your target market. It will come as no surprise that many companies in the financial services space are increasing their social media efforts. In fact, many surveys have pointed out that social media is now one of the top lead generation sources for businesses of all sizes. 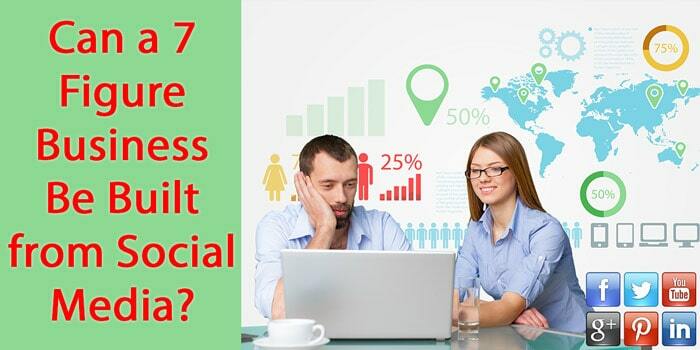 Today I am going to take a look at the top 5 benefits of social media marketing, especially regarding the financial services industry. Click the play button below to view a video highlighting all the key benefits. 1. Increase the number of eyeballs to your best content. The 1st benefit of social media marketing is it will help increase the number of eyeballs to your best content. Your company likely has a solid content marketing team or analysts churning out research for the market on a daily basis. Social media allows you to distribute your message to your targeted audience who are tuned in to receive your messages. Your content team should be focused on generating evergreen written content, while your analysts are focused on the daily market commentary. This content strategy provides a perfect combination for social media as you will be showcasing your interesting trading articles, which will receive the highest click-throughs from social media. The daily market commentary will have an excellent chance of being picked up by the critical journalists in the industry. This will help bolster your media campaign too. The top finance writers are very active on social media. The 2nd benefit runs off the first, and this is the ability to increase your retargeting lists. Retargeting lists are the ideal way to show targeted ads to those people who have already visited your website. So the flow goes like this. Potential or existing clients hit your website. You have a cookie on your site that identifies them as a visitor to your site. You can then display your ads to them as they navigate around the web, searching other sites that show retargeting ads. Google and Facebook are the two biggest ad platforms that allow you to set up retargeting pixels to track your site visitors. By creating great content, then pushing your message out via social media, you get a high number of people coming back to your site. This will help increase your retargeting lists for further targeted advertising. Increasing your retargeting lists is one of the top reasons why content marketing is one of the most powerful ways to turn visitors into prospects. You can also use it to build your email list and make more sales at a lower cost per acquisition. In the case of CFD or Forex companies, retargeting is one of the best ways to reduce your CPL or CPA. Social media is one of the best distribution tools for your best content. Your social media team should be creating a suite of useful posts that can be used across your top social media platforms, like Twitter, Facebook, YouTube and LinkedIn to name a few. Always keep in mind the objective of your campaigns. You may not make the sale right then and there, but by actively pursuing the promotion of your content to increase your retargeting lists, you will find more sales come along the way. Thirdly it will help increase your website traffic and in turn, boost your search engine rankings. Top SEO in 2016 is about great content which is shared widely online. The ability to share comes down to social media channels, which provide a host of high page rank links pointing back to your website and content. The more links you have pointing back to your website, the higher your rankings will appear in the search engines. The SEO concept mentioned above is a big picture view, and front page rankings take a lot more links, especially for highly competitive keywords. Backlinko’s study of 1 million websites did confirm that links are the number 1 ranking factor. You are no doubt already aware of the fact that when you create a high authoritative piece of content, the number of social shares skyrockets. If you consistently pump out short articles which don’t quite hit the mark, then the number of social shares will be small. Once you have your authoritative content, your job is to get the social media ball rolling. Pushing out your social messages will allow your most ardent followers the chance to share your content. You will be surprised with how far and wide a solid piece of content can be distributed. All of those links will be pointing back to your original content. The fourth benefit is the repetition of message. Sales aren’t made in the first message or 1st great piece of content. You need to distribute and repurpose your content across many channels to convert prospects into clients. Create imagery to use via social media. Consider turning it into an infographic which will be easily shared via social media. As mentioned already, your job is to distribute and leverage every possible piece of content you have. By leveraging your content, you will be able to drive more awareness back to your website. If you ‘disappear’ from social media for just 30 days, you will be surprised with the drop-off of social media driving people back to your website. Be sure to check in on your Google Analytics stats to see how much traffic is coming from social media. Lastly, social media helps build the credibility and the authority of your brand. People trust those who are the authority in their niche. You cannot just rise to the top and become an instant authority. Trust needs to be built over time. One of the best ways to establish this trust is using social media. By building your social media followers and posting rock-solid content via these channels, you have the greatest opportunity to build your credibility. One smart entrepreneur, Sol Orwell, built a 7 figure business off the back of Reddit. Reddit was Orwell’s preferred social media platform, allowing him to build his credibility with a huge potential audience. Over time, Orwell built up such a strong reputation. He was able to leverage his authority into a phenomenally successful online business in the health niche. Once you become the trusted source of information, cold prospects turn into Leads which then turn into sales. Social media is all about engagement. So this is an added benefit of using social media. It isn’t always about making more sales, but often, the ability to carry on the conversation is crucial. Being there for your clients and providing them with another channel (which they might be active on) to chat with you and your team, is paramount. In today’s fast-paced world, people expect a response within hours. Social media provides you and your team that opportunity. Responding fast will allow you to go above and beyond regarding servicing your clients and prospects. Over to you. How are you and your team using social media to engage, drive more sales and carry on the conversation? We’d love to know your best ideas and what has been working for you.